What an exciting time to be a gardener and a cook. Everywhere we look, from seed catalogs and plant nurseries to farmers markets and our own vegetable beds, we find edibles in every color and shade. They sure are pretty, but that’s not really the point. Good looks get attention for everything from plants to people, but these beautiful new (and old) food crops offer a lot more than a pretty face. Ongoing research turns up more health benefits for colorful food every day. Along with natural fiber, lots of minerals, and vitamins, colorful vegetables offer powerful antioxidants such as bioflavonoids, plant metabolites that promote plant and human health in dozens of ways. Each kind and color of edible creates its own range of bioflavonoids, and all have somewhat different effects on living systems, whether human or animal. The rapid proliferation of colorful food is largely encouraged by what we are learning about their nutritional values. 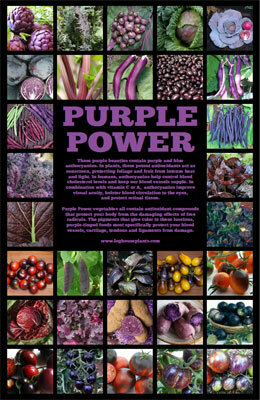 As an example, that’s why naturally purple foods are increasingly popular. Above and beyond their novelty value, all these dusky edibles from purple carrots and potatoes to purple tomatoes, purple sweet potatoes, purple broccoli, purple cauliflower, purple cabbage, purple kale and purple lettuce, pack an extra nutritional wallop. In addition to the usual fiber, vitamins and minerals that make fruits and vegetables healthy foods, these purple beauties contain purple and blue anthocyanins. In plants, these potent antioxiants act as sunscreen, protecting foliage and fruit from intense heat and light. In humans, anthocyanins help control blood cholesterol levels and keep our blood vessels supple. In combination with vitamin C or A, anthocyanins improve visual acuity, bolster blood circulation to the eyes, and protect retinal tissue. The best known antioxidant may be lycopene, which creates red and purple colors in tomatoes, peppers, cherries, pomegranates, blueberries and other naturally red and purple foods, from apples to watermelon. Lycopene improves both short term and long term memory (make mine a double, please). It also helps cleanse toxins from our blood, reduces cholesterol buildup, and nourishes and protects the heart. As many folks now know, lycopene helps fight certain cancers, notably those affecting the prostate, testicles, breasts, cervix, and skin. One interesting study showed that ketchup made form organic tomatoes contained up to 4 times as much lycopene as regular brands. A number of studies have indicated that organically grown foods create and retain more nutrients of all kinds than similar crops raised by conventional methods. Still more studies show that these potent antioxidants are most effective as naturally occurring compounds rather than synthesized chemicals. Thus, we benefit more by eating organically raised foods, lightly processed or not at all, than by taking artificial supplements. This year, I’m planning to grow my own All Blue potatoes and purple Peruvian sweet potatoes as well as Purple Haze carrots, purple Rosalind broccoli, Redbor kale, Ruby Ball cabbage, Red Chidori kale, purple Sugar Magnolia peas and Violet Podded snap beans. I’ve also got plans for those luscious, purple-tinged INDIGO family tomatoes, which are especially rich in anthocyanins, the antioxidants that make blueberries a superfood. In most tomatoes, the anthocyanins are restricted to the foliage. In the hand-bred INDIGO tomatoes, anthocyanins are expressed in the fruit, where they partner with lycopene and other phytonutrients to create a nutritional matrix of complex compounds that make these tomatoes exceptionally flavorful and nutritious. In contrast, the GMO purple tomatoes recently introduced as juice in England owe their anthocyanins to snapdragon genes that were artificially introduced by gene splicing. The result is indeed an increase in anthocyanin production, but it is not yet known whether unintended side effects may also be present…. In any case, I’m sticking to the INDIGO girls! This entry was posted in Nutrition, Sustainable Gardening, Sustainable Living, Tomatoes. Bookmark the permalink.